The charity, Cardiac Risk in the Young (CRY) was bowled over by the support of Kent’s cricketers at the weekend, with the launch of an “all star” festival, held in the grounds of Eltham College, South East London. CRY – a national charity that Trinity has been involved with for over 13 years – and the Ben Daniels Memorial Fund (BDMF) hosted the family fun day on Saturday (September 10). 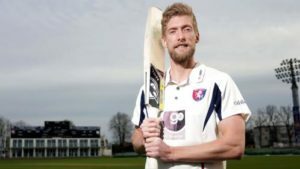 However, the event was driven by two of Kent Cricket’s “Spitfires” Calum Haggett and Ivan Thomas who have both been affected by sudden heart conditions. In 2010, Calum was identified with a potentially fatal heart condition during a routine screening but was successfully treated and is now back in the game. However, tragically, in 2012, one of Ivan’s friends and teammates at university, Tom Hardman, died in his sleep from an undiagnosed heart condition aged 21. The duo were approached by Kent dad, Paul Daniels, who lost his son Ben to an undiagnosed heart condition in March 2011. Ben Daniels tragically died whilst playing football, aged just 15. Ben was a very talented sportsman and played for Old Elthamians Cricket Club (OECC). Every week, 12 “apparently” fit and healthy young (aged 35 and under) people in the UK die from a previously undiagnosed heart condition. In 80% of cases, there will have been no signs of symptoms, which is why CRY believes proactive screenings is so vitally important – now testing over 23,000 young people every year. Sport itself does not cause young sudden cardiac death but it can exacerbate an underlying condition, if not identified. The Ben Daniels Memorial Fund has raised almost £150,000 to support CRY and screening. As a result of Paul’s efforts, around 1,500 local, young people have been tested over the past five years, in memory of Ben – a figure that is set to grow, due to the volume of screenings due to be funded by the BDMF and collaborations with a range of sports clubs across Kent and the South East. CRY has an established heritage of working closely with the world of cricket and currently has the support of three great names from the games who are all Patrons of the charity; Sir Ian Botham, Joe Root and Rob Key. CRY’s screening team also delivers regular testing to a number of County Cricket Clubs – a scheme that is due to grow and develop across England.